now, UFC 173 is completely without a main event, and at this stage of the game, without any obvious options. Almost all of the biggest stars and champions are either injured, coming off recent fights, or already booked on other events. If the UFC wants to highlight this event as they have in the past, they really need to pull a rabbit out of their hat. Which brings me to my point—I’ve delayed it long enough for fear of getting lambasted by the group of readers who have strong feeling toward this topic…Nick Diaz. Now that I assume everyone is done spitting their Sierra Mists all over their computer monitors and flipping tables (and quite possibly de-friending VigilanteMMA on Facebook), let me continue with my hypothetical example. All I’m asking is, WHAT IF? Would the presence of Diaz at the top of the card (even as co-main event) make this event legitimate? Diaz calls himself one of the only draws in the sport and quite honestly, he’s probably correct. So who would he fight? It might not matter, but it does have to be a semi-important bout for two reasons—first, Diaz isn’t going to come out of “retirement” to fight TJ Waldburger; and second, that fight wouldn’t headline a Bellator card (yes it would), let alone UFC 173. What about Tyron Woodley? He didn’t take much damage in this month’s bout with Carlos Condit and he’s currently one of the highest rated welterweights in the world. What about Rory MacDonald? The same can be said about him. Both of those fights tick multiple boxes on what everyone is looking for. 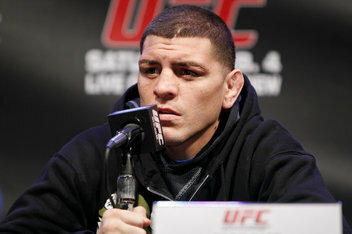 It gets Diaz back into the octagon, which benefits his rabid fans and the UFC. It also gives the UFC a chance to get a more solid handle on the current landscape of the welterweight division at a time where there’s no clear cut #1 contender for the now-injured champion Johny Hendricks. It gives Diaz a true reason to come back—he’s getting a big fight (which they might have to call a #1 contender fight in order to lure him back) and he’ll likely be compensated for “saving” a PPV. It’s a big ego stroke for him. Mostly it allows the UFC to salvage what is normally a signature event for them each year without having to compromise any of their champions. Making Ronda Rousey defend her title on short notice again seems like pushing their luck, and a little unfair. Honestly trying to book any hot shot headliner with only about 8 weeks notice is a tough one. But Diaz is probably in fighting shape right now, so the timeframe likely wouldn’t bother him at all. For the dozen or so of you who are still reading this (and still our Facebook friends), what do you think? I’m not even advocating this as much as posing a question. I’d have to say, I would much rather watch this event with Diaz as the headliner in a meaningful match than watching them try to put a Band-Aid on this thing. I’ll bend over and wait for your comments—please be gentle. What was the best Walkout Song from UFC 171?